Unsaturated vertical flow (VF) systems are essentially the same as the horizontal flow systems in that they comprise a lined excavation. Unlike the horizontal flow reed bed the vertical flow is not constantly flooded but free draining. The effluent is applied in a batch process across the surface of the bed until the surface is flooded. The effluent gradually drains down through the bed with air replacing the wastewater in the bed as it drains. The next dose traps the air which leads to a highly aerated system with good oxygen transfer permitting increased microbial growth and activity. Unsatruated VF systems are more effective than HF systems at ammonia removal due to increased oxygen levels within them and can cope with stronger effluents. To achieve a batch flow the effluent is delivered to the bed via a pump, flusher or siphon system. In preference we prefer to use the siphon systems as these require no power. 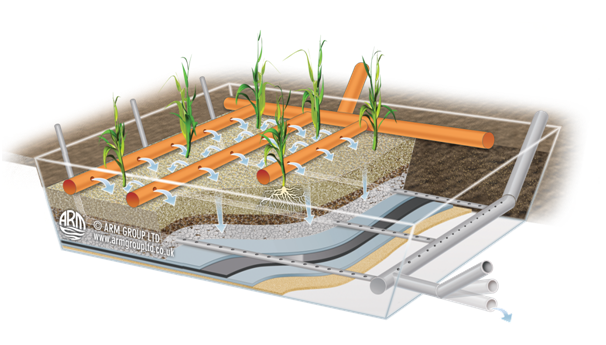 The effluent is distributed over the bed sometimes aided by a layer of sand and then passes through the bed where treatment occurs. The effluent is collected in pipes positioned along the bottom of the bed and discharged through the outlet.